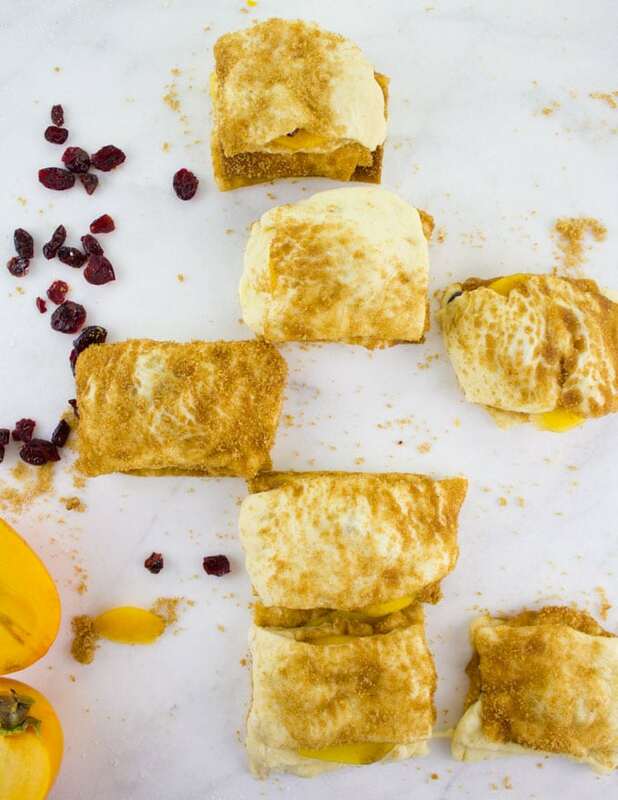 This heavenly recipe is sponsored by my favorite brand of Spanish persimmons, persiMon® — they’re unbelievably, sweet, good for you and have a pleasant bite, since they’re non-astringent! Being from Spanish region Ribera del Xúquer, the persiMon® brand is grown to the highest industry standard and you can absolutely taste the difference! 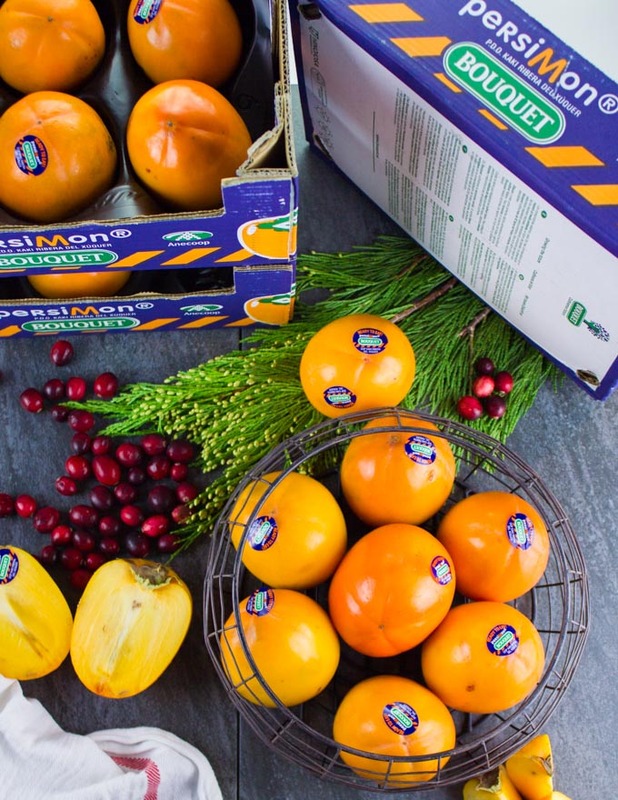 I’ve always been a fan of this fruit and wait for it every Holiday season, but this year I tried persiMon® and fell in LOVE all over again! 🙂 Look for the persiMon® sticker to ensure you’re getting a Rojo Brillante variety of persimmons that grow in the Ribera del Xúquer region of Spain, and taste the difference for yourself! It’s been a crazy baking season for me and by all means, I’m not complaining. I was in charge of baking for Thanksgiving and now for the Holidays, so my home has been smelling so warm and cozy for the last few months. Baking puts me in a better mood, keeps the girls busy helping mommy, keeps my sweet-toothed hubby happy and makes my neighbours pamper me with favours because I always share everything I bake with them 🙂 I probably should stick to baking every season. 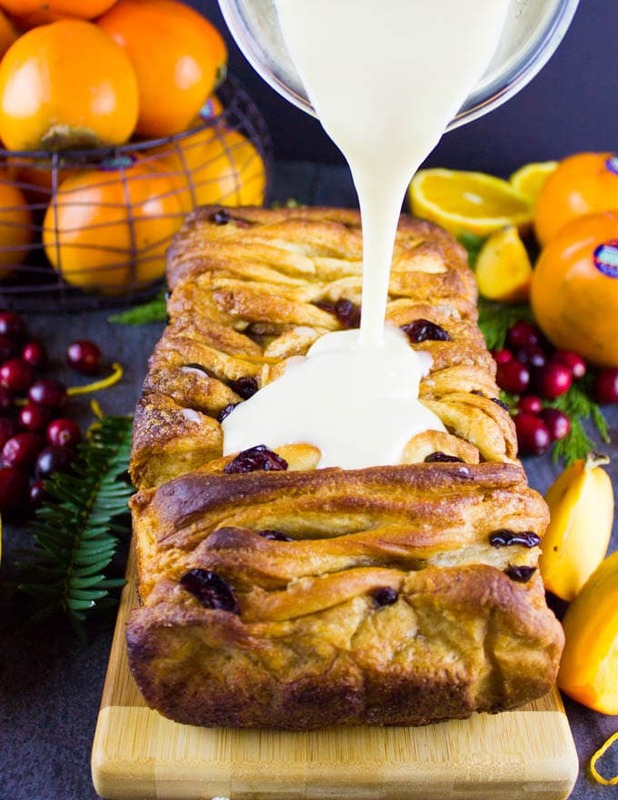 Today’s cinnamon pull apart bread isn’t just luscious because it’s a cinnamon pull apart bread, but because it’s studded with persiMon® 🙂 This fruit is officially part of my Holiday traditions. First of all, it’s addictively delicious, it’s loaded with fibre (a good 6 grams per piece!) and it’s so versatile. So, while it’s a sweet fruit, persiMon® is also great for salads, soups, appetizers and more! Try this Buckwheat Persimmon Salad and Sweet Persimmon Apple Kale Salad too. 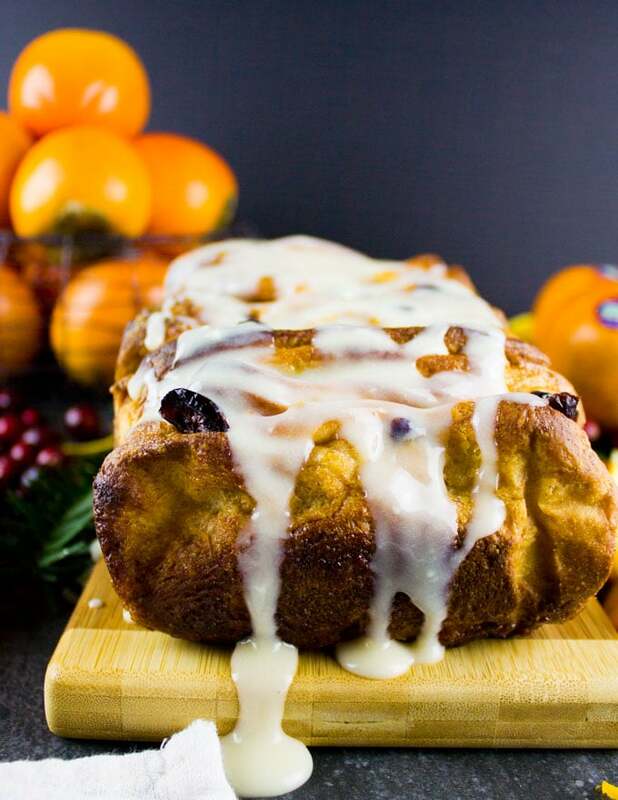 Another fabulous baking recipe is this Persimmon Hazelnut Raisin Swirl Loaf recipe—You’ll be hooked! 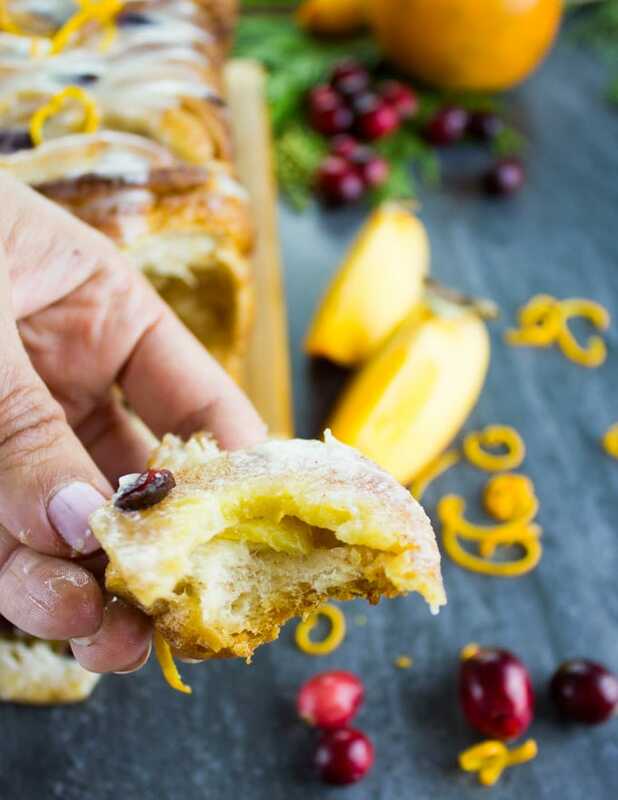 Before the luscious cinnamon pull apart bread, I have to mention that this persiMon® fruit is delicious as is, peel on, everything. Bit right into it or slice it up for a healthy snack. Unlike other varieties of the fruit, it has no seeds, so you can give it to your kids without worrying about that. When baked, the persiMon® softens and sweetens up, while still holding on to it’s firm and crisp texture. I absolutely LOVE baking with fruits that retain some of their texture. I wish this fruit was available all year long, but because it only comes up in November-January, I think it feels more special, and more like a festive Holiday fruit 🙂 Today’s recipe is a perfect candidate for the Holiday dessert table, Holiday day breakfast, New Year’s Eve parties, and just about any day you feel like something special! 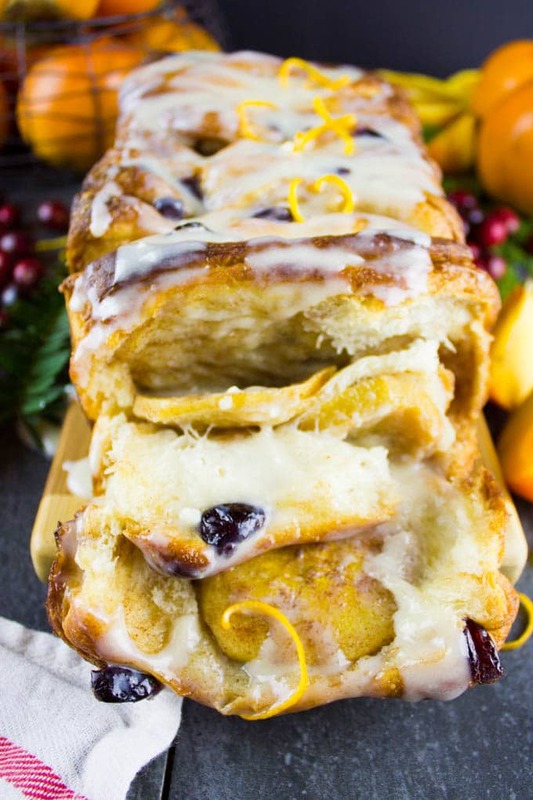 You can buy store bought crescent dough or use my previous Persimmon Hazelnut Raisin Swirl Loaf dough recipe because it’s infused with grated persimmon fruit—so it’s DOUBLE the deliciousness! 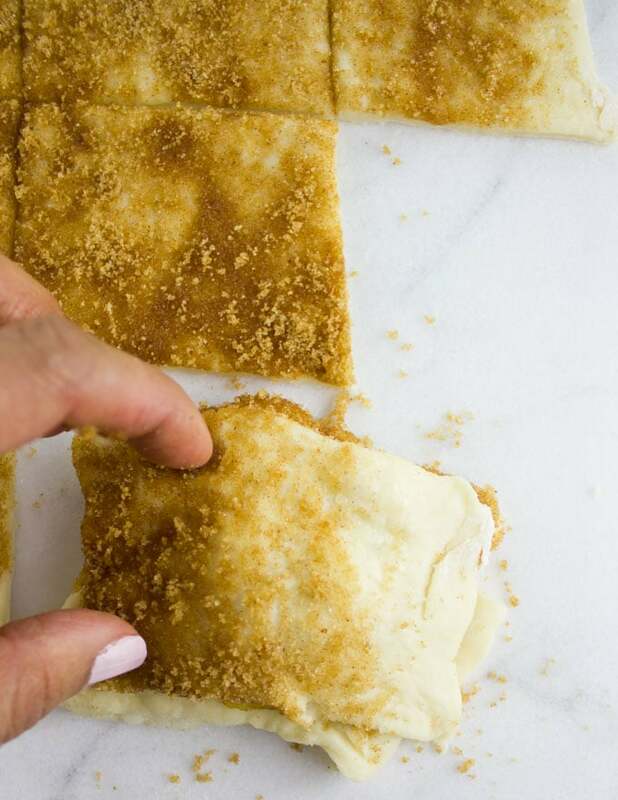 Otherwise, the recipe below is simple a mixture of flour, sugar, salt, yeast, butter, orange zest,1 egg and milk all mixed together and then you’ll forget about it for a couple of hours before rolling it. When rolling out the dough, make sure it’s as even thickness as possible, and don’t bother about it looking perfect because it’ll get cut up anyway. 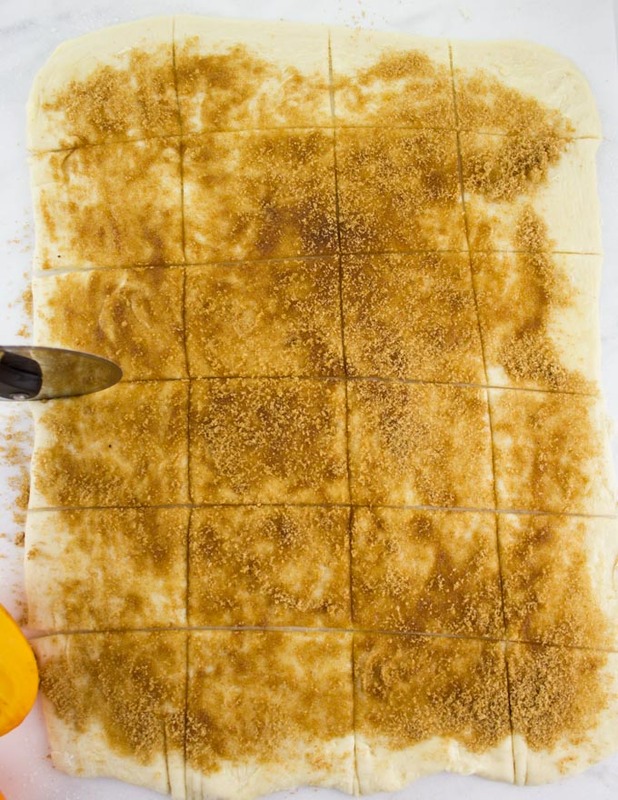 Start off by brushing the dough with melted butter and sprinkling a layer of cinnamon brown sugar over it. 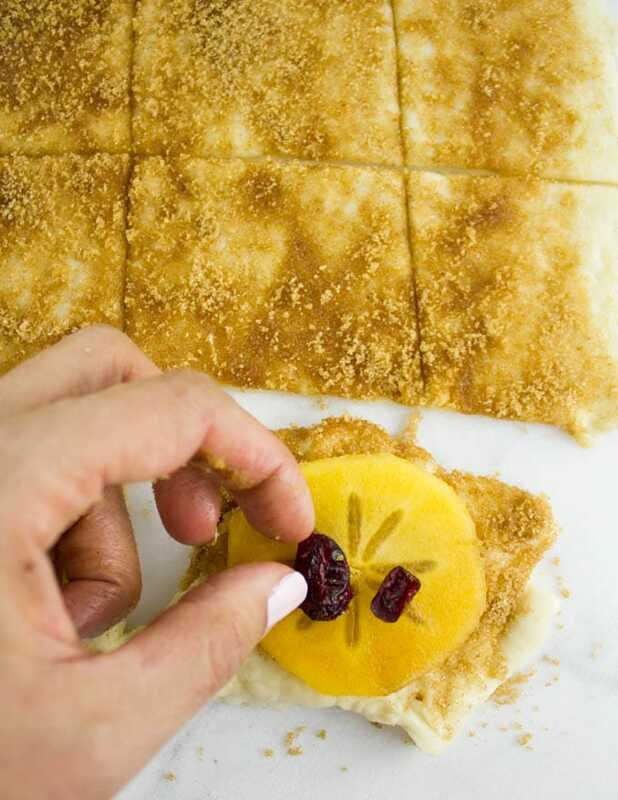 Similarly, this step doesn’t have to be perfect, in fact the beauty of this recipe is making it feel, look, smell and taste like homemade LOVE 🙂 Cut up the dough into squares about 2 inches in size and then layer a slice of persiMon® over the dough, a couple of cranberries (optional), more dough, more persiMon®, some cranberries, and finish off with dough. 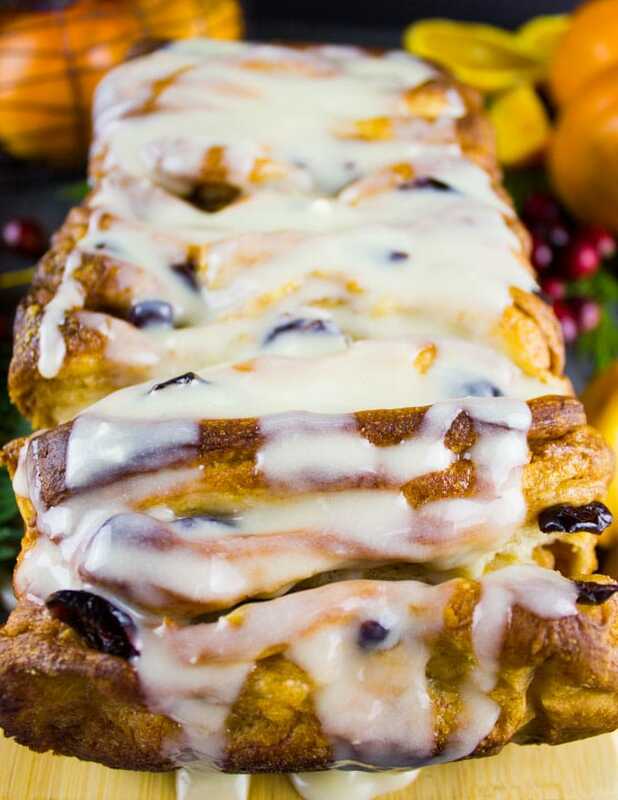 Here’s a tip, don’t pile up high layers of cinnamon pull apart bread and persiMon® stacks, you need just 3 layers at most and repeat the process with the remaining dough. This way it’s easier to arrange them in the loaf pan. 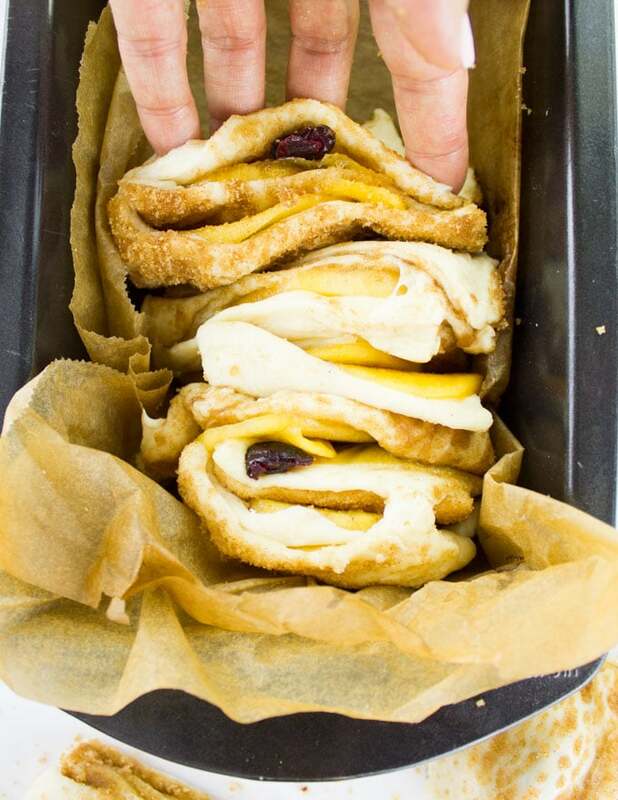 Now grab your stacks and place them in a parchment lined loaf pan and press them against each other until you fill the whole pan. An hour later this heavenly pull apart bread hits the oven and 40 mins later you’re ready to devour all the goodness!! Now guess what? Here’s the best part. 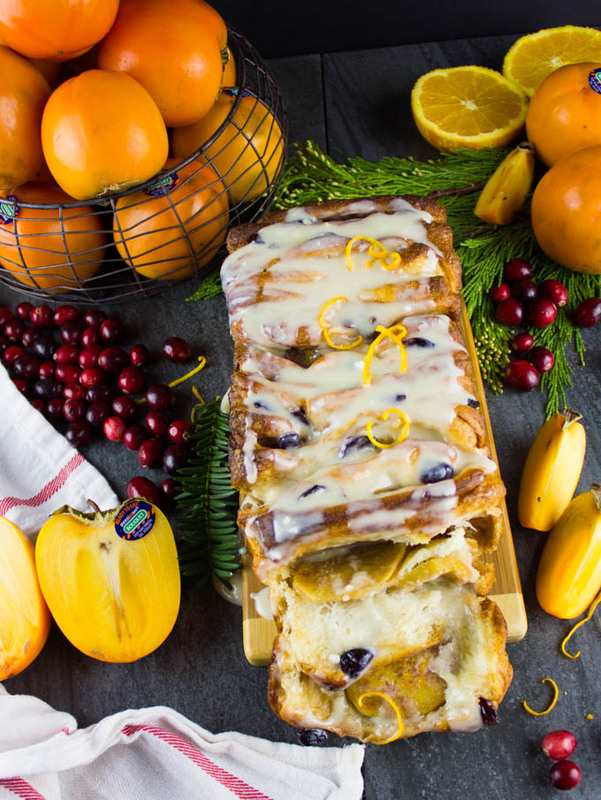 Pull off layer by layer of the persiMon® cinnamon pull apart bread and DIG IN! And the good news is— you can assemble the bread in the loaf pan and cover it in the fridge for up to two days, just bake it the day of, straight form the fridge and you’ve got a luscious treat to enjoy! Likewise, the glaze can be made and stored in the fridge, but it will harden just a bit. So either microwave it for 20 seconds or leave it at room temperature while you’re baking the bread and it should loosen up! 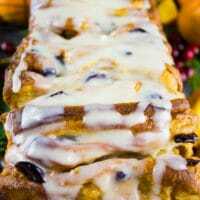 I urge you to make this persiMon® cinnamon pull apart bread recipe and tag me so I can see your yummy creations!! Enjoy this goodness of a bread and the deliciousness of persiMon® while it lasts! Happy Holidays and Happy Baking!! In a large bowl, mix the flour, yeast, sugar and salt until well blended. Always start with the less amount of flour (2 1/2 cups) so that you can add later if you feel the dough is too sticky. Mix those ingredients well. In another bowl, mix the milk, melted butter, orange zest and egg and then add them to the flour mixture. Use a wooden spoon (or stand mixer if you’d like) to mix the dough. If the dough is very sticky, add a 1/4 cup of flour at a time and mix it in to see if you need more. The dough should not feel dry, rather soft and slightly sticky to your fingers, but not loose. 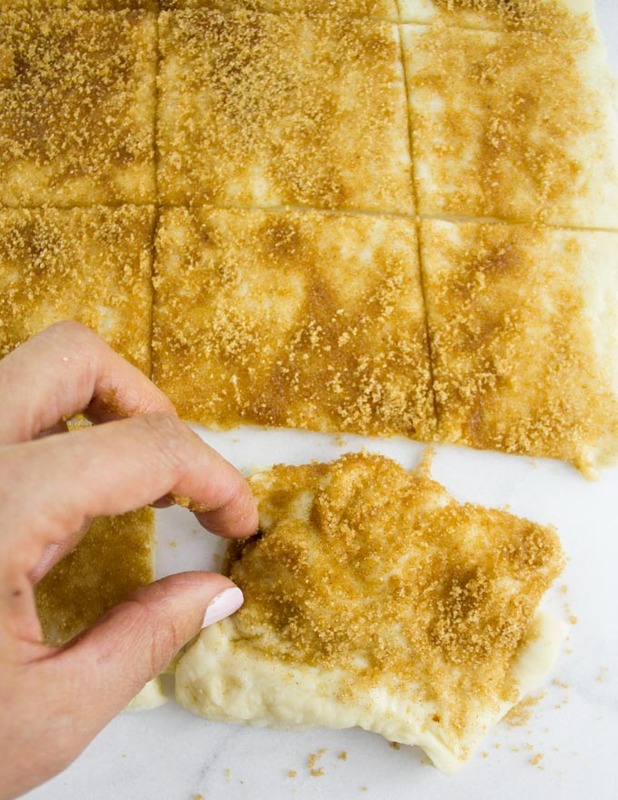 Use your hands to gently fold the dough to make it as smooth as you can (just two minutes). Cover the dough and let it rise for about two hours until it has doubled in size. 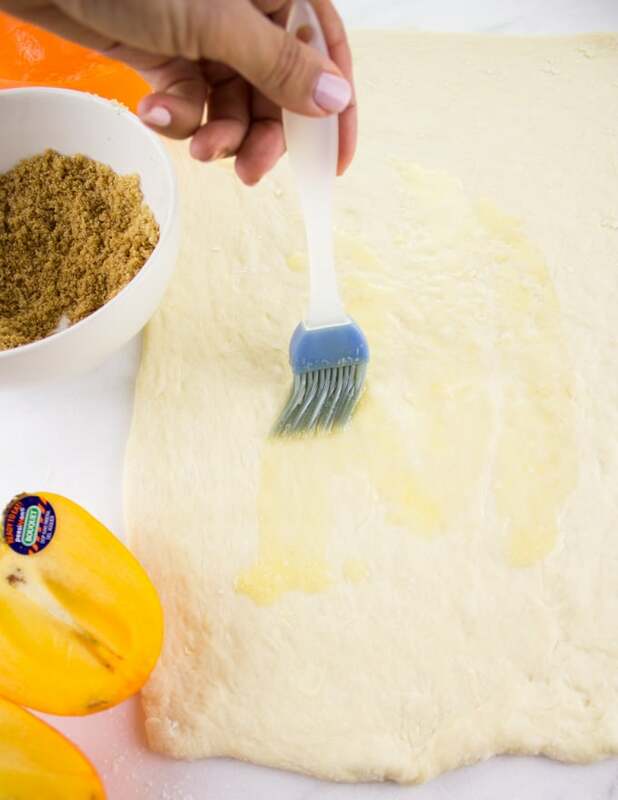 On a floured marble/kitchen counter, roll out the dough into a rectangle about a quarter of an inch thick. 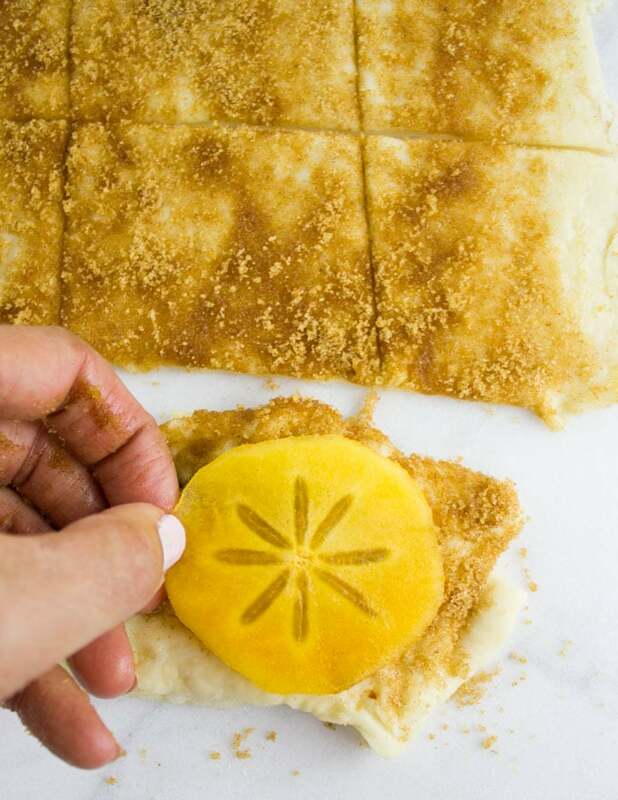 Brush the surface of the rectangle with melted butter and sprinkle the cinnamon sugar mixture. 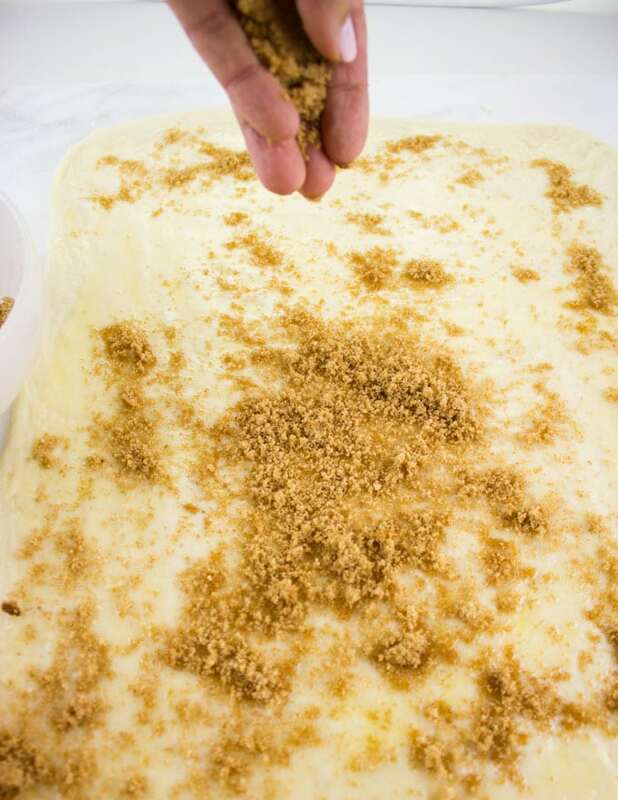 Press down the cinnamon sugar mixture slightly to stick it to the dough. Use a knife or pizza wheel to cut up the dough into 2 inch squares. 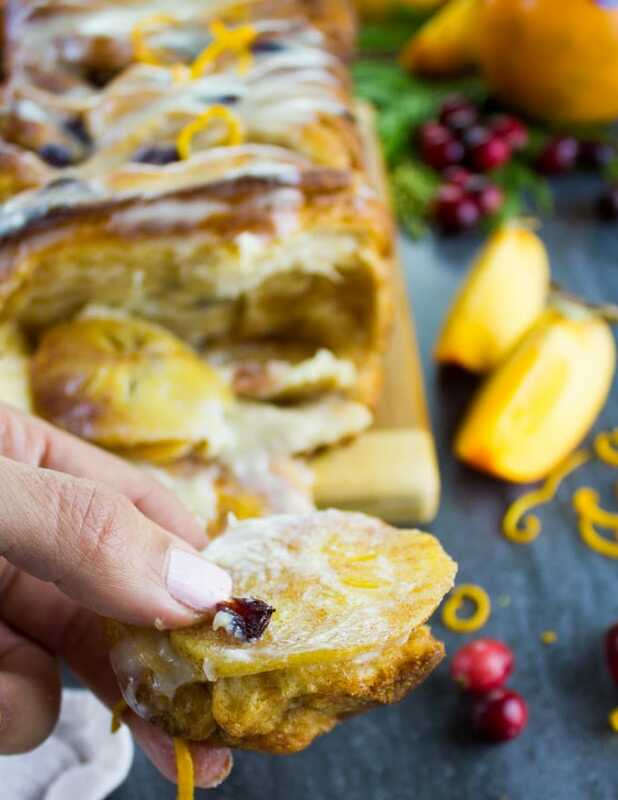 Take one squared dough and top it with a slice of persiMon®, a couple of cranberries and another piece of squared dough (with cinnamon filling facing up). Layer another piece of persiMon®, cranberries and dough. 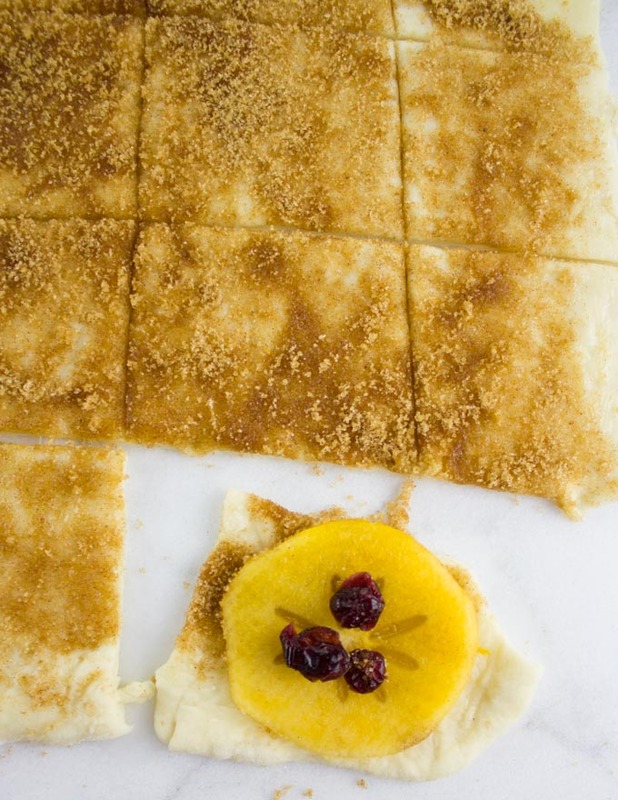 repeat until you’ve got about three layers of fruit in between the dough. Then start over again with a new piece of squared dough rather than layering a tower of fruit and dough. You should have about 7-8 stacked pieces of dough, each about three layers of dough and fruit. 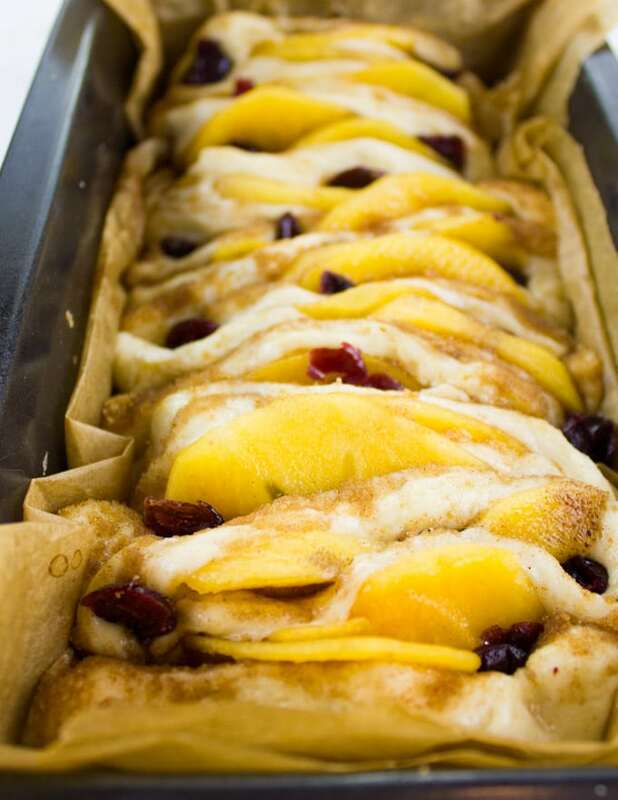 Take a parchment lined loaf pan and arrange the stacks of fruit and dough sticking them together as close as possible to fit them in the pan. Cover the pan and let it rest for another hour. At this point you can refrigerate the loaf for up to two days and bake it straight from the fridge. Preheat the oven to 375 degrees Fahrenheit and bake the pull apart bread for 40 minutes until golden and puffed. Remove the pan from the oven and let it cool for 10 minutes. Remove the bread from the loaf pan and drizzle with the glaze. Pull apart pieces of bread and enjoy! Mix all ingredients in a bowl, thinning out the glaze with extra milk or thickening it with extra sugar if needed. Glaze may be stored in the fridge for a week. 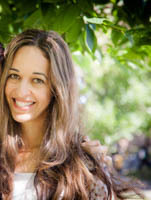 If it hardens, just microwave it for ten seconds or let it sit at room temperature until it loosens up. I have never baked with persimmons though I love them. 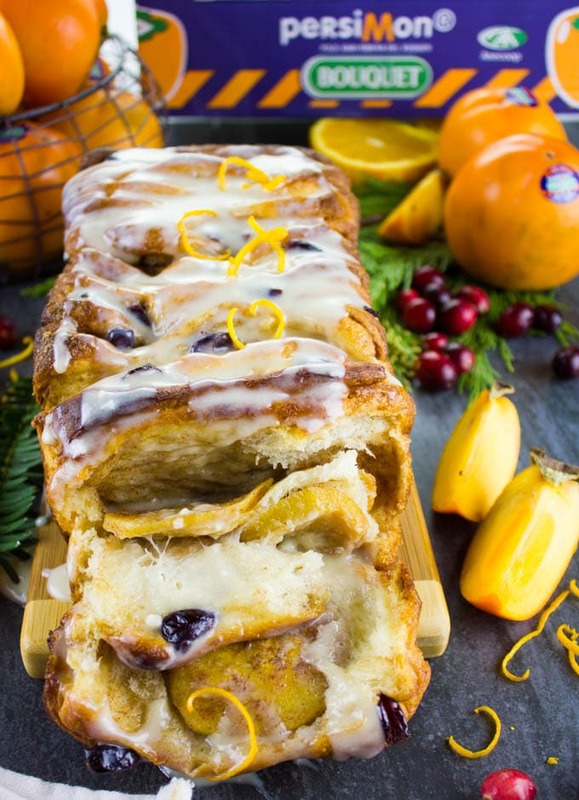 What a delicious fruity bread this is!